Because it sits on high ground, Luxton School was headquarters for the Police, Navy and Scotia Street Flood Sufferers Association during the 1950 flood. 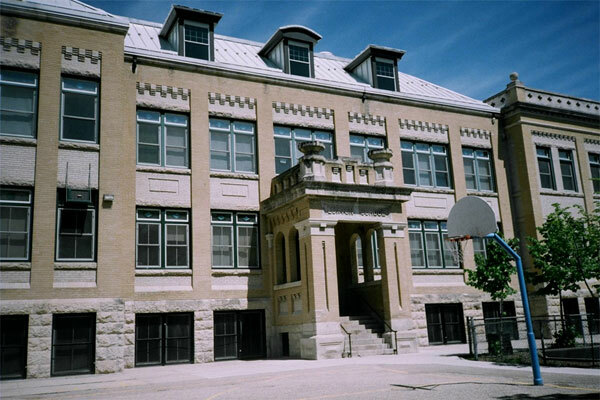 Located east of Main Street, the school sits at the top of a steep rise that falls away to the Red River. Floodwaters rose so high the Navy docked their boats near the school. The building we see today is actually two distinct places, both designed by School Architect J. B. Mitchell but built eight years apart. This concrete, limestone and pale brick building has the original 1908 section on the east and the 1916 addition on the west. The detailing and execution of the later part are much better quality. 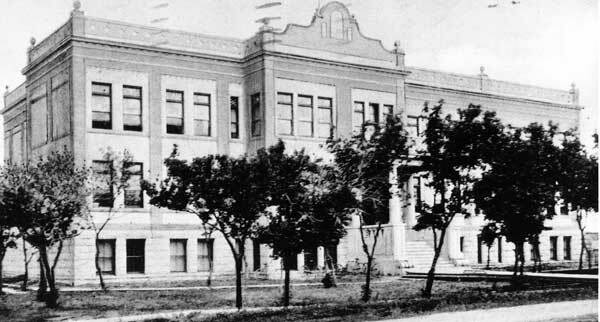 Construction of the 19089 school building began in 1907, with a cornerstone laid by school board chairman J. A. McKerchar at a ceremony on 30 September 1907. The nine-room addition made in 1915-16 was built by the construction firm of Worswick Brothers, at a cost of $50,000. It raised the capacity of the school to 1,000 students. William Fisher Luxton, besides being Winnipeg’s first school teacher, was a founder of Winnipeg General Hospital, a charter member of the Winnipeg Board of Trade, a member of the provincial Board of Education and active in provincial and federal politics. Another of his lasting contributions was the Manitoba Free Press, which he started with John Kenny on 9 November 1872. It evolved into the Winnipeg Free Press in 1931. Luxton died the year construction of the school began. His portrait still hangs in the school. Noteworthy alumni of Luxton School tend toward the arts and show business including novelist Adele Wiseman, game show host Monty Hall, and singer Burton Cummings. In 2017, the school became a municipally-designated historic building. 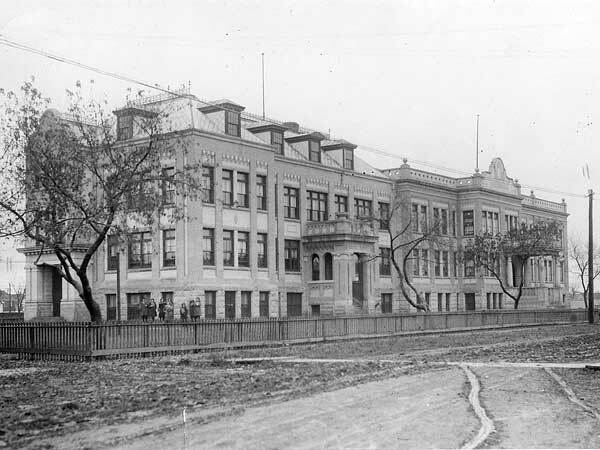 Source: Archives of Manitoba, Winnipeg - Schools - Luxton #1, N16956. “Winnipeg schools, No. 18—Luxton,” Manitoba Free Press, 4 November 1922, page 5. This page was prepared by Gordon Goldsborough, Nathan Kramer, and Reid Dickie.